Event styling or event designing is the phase focusing on encompassing aesthetic elements in support of your event’s theme. It often comes after the client has met with one of our superb event planners to plan the event and settle on a theme. Our event stylists then come up with ways of introducing the ingredients that will help make your event immersive. Even immersion is key as it makes your event more enjoyable for your guests. It can help propel your event to greatness. Every event planner knows that design and styling an event is the main part of event planning. Event design starts with many tasks but one and the most important part is event styling. Events by Vivid has been working in this industry for many years. We’re well-versed with what businesses want to see in their events. Our many satisfied clients will attest to the level of care we have shown in getting their events running. Event styling is different than event organizing and planning. 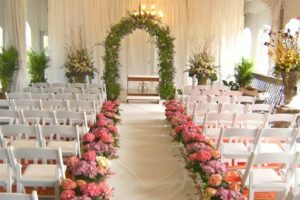 Perhaps the simplest way of looking at it is by considering event styling as a constituent of both event organizing and planning. This is because both event organizers and event planners need to decide on a few things first before event stylists can be brought into in the discussion. Event organizers need to choose the appropriate venue for the event. Event planners need to meet with the client and help them plan for the event. Only once these initial hurdles have been addressed can event stylists begin their work. This is all evidence of the level of teamwork that needs to take place for an event to come together. Event designers/stylists work involves them planning on how best to incorporate the visuals and aesthetics necessary to make it all come true. They use their creativity to enhance the look and feel of an event. Think floral arrangements, seating arrangements, customized decor detail, interior and exterior design, and more. They give life to your event, making it real and breathing. Events by Vivid has many decor props that we offer to rent out to our clients. Our event stylists will help you find the perfect props for your event. Thinks draping services, floral arrangements and more. All the stuff that you can use in your overall event design. By adorning the venue with beautiful curtains, paintings, and other drapes, you’re making a fashion statement. You’re signaling to your guests that you have taste and that you understand all that makes for a great function. The perfect event. An excellent floral arrangement can make a big difference. It can bring about that touch of beauty and beauty that sets the perfect event out from an okay one. Event stationery can make a big difference in the way your event is perceived. Perception is key as it can make your event more premium and exclusive. This can help your guests feel happier about attending. Invitation cards, save the date cards, event flyers and menu cards are all part of the stationery that we frequently use to promote gatherings, galas, wedding receptions and commercial events. They’re proven to be effective. How can Events by Vivid help? Our professional event organizers can help overcome all the aforementioned obstacles by working closely with your business. Because of the contacts we have built over the years working with vendors, venue owners, our partners and other members of the community here in Houston, we can make planning, organizing and hosting events affordable and stress-free. Our experienced event planners, event organizers and event coordinators will work closely with your business to make your event the best it can be and at a fraction of the cost of doing it all in-house.